Internal Heat Re – activated type. Heat Reactivated Air Dryer is used when one needs compressed air of very low dew point of (-) 60o C or 80oC. In Heat Reactivated Air Dryer, the desiccant is regenerated at higher temperature, along with small quantity of dry air purge. Due to purging with dry air and thermal regeneration, residual moisture loading on desiccant becomes low and this gives very low dew points. The drying unit has 2 vessels filled with Activated Alumina or Molecular sieves desiccant. One vessel remains in drying cycle for 4 hours, while other vessel is simultaneously regenerates at atmospheric pressure. Around 3% flow of dryer capacity is used as purge for regeneration. Electrical heaters are provided in a central finned stainless steel pipe in both drying vessels. Heating cycle is for 2 hours and in this time hot purge air increases desiccant temperature to around 100 degree c. At this temperature, regeneration is complete (due to dry air purge). Dew point achieved is around 40 degree c. If still lower dew point is required, air-purging rate is slightly increased to 5% for 60 degree C and to 7.5% for 80 degree C DEW point requirements. A pre-filter with automatics drain valve is provided to remove any physical moisture from Compressed air before entering air Dryer. A Micron filter is also provided in dryer outlet to arrest any desiccant dust particles, up to 1 micron size. Thus you get absolutely “Clean & dry compressed air. 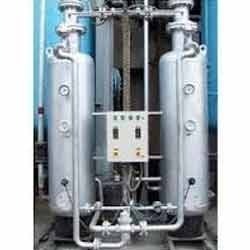 An ISO 9001:2008 Certified Company, AVS Engineering Co, is recognized among the noteworthy,Manufacturers, Exporters and Suppliers of a broad assortment of Industrial Machinery and Plants like PSA Nitrogen Gas Plants, Lab Scale Nitrogen Gas plant, Ammonia Cracker with purifier, PSA Oxygen Gas Plants, Co2 Dryer, PSA Hydrogen Gas Plants, and Heat less type , Dessicant Type, HOC Type, Heated type , Refrigerator type Air Dryers, Pressure Vessels, Bio Gas Purification System, and so on. These products are designed and fabricated using high-grade components and latest technology in conformity with international quality standards and are highly demanded in the market due to their consistent performance, sturdy construction, less maintenance, easy installation and longer service life. Also, our organization is supported by an adroit team of professionals who incorporate innovative concepts in the fabrication process to develop excellent products. Being a client oriented organization, we emphasize on achieving 100% client satisfaction. In order to achieve this goal, we offer these products in different technical specifications and can also be customized as per the needs of the clients. With our quality control procedures, we also ensure our clients that our product range is brilliant in terms of performance, appearance and finish. We also have the support of a wide distribution network that helps us in supplying these products on timely manner. Further, our ethical business policies, client centric policies and competitive prices have garnered huge client base all across the market.